The Hare-Clark voting system as used in Tasmania's multi-member electorates, is one of the fairest political systems in the world. In the recent Tasmanian election, five members are elected from each of the five electorates, which make a total of twenty-five members in the House of Assembly. One of the benefits of this system is that the end result is very similar to the will of the voting public. Take a look at Australia's federal lower house, the House of Representatives. This system uses single member electorates. Each of the 150 seats nationally elects a single member using preferential voting. But look at the last federal election - over 16% of voters chose a member outside of the major parties (ie. Greens, Democrats, Family First, another smaller party or another independent) as their first preference - but in the final makeup of the house, only 2% of the seats are represented by a non-major party. In the recent Tasmanian election we see how the system *should* work. The first preference votes received were split between Labor 37%, Liberal 39% the Greens 21% and other parties 3%. The final distribution of seats is Labor 10 (40%), Liberal 10 (40%) and the Greens 5 (20%). A much more accurate representation of the choice of the people. 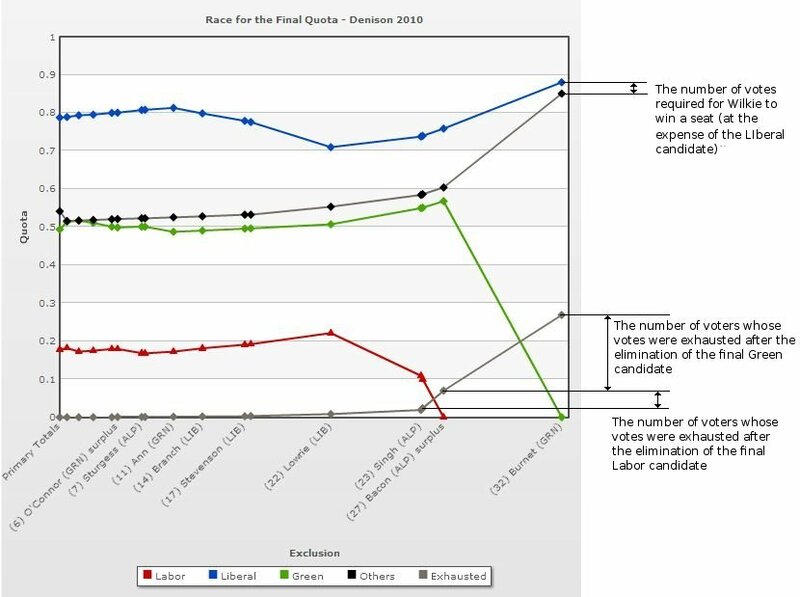 Along the bottom of the graph, you see each candidate as they (or in the case of those who secured a quota, as their excess votes) are eliminated. When one of the coloured lines goes to the bottom of the graph, it means they were the last candidate for that party. The dark grey line near the bottom shows "exhausted" votes. Voters were only required to enter numbers 1 to 5 - anything above that was optional. When one of the ballot papers "runs out of numbers" so to speak, it becomes an "exhausted" ballot. Notice the rather small difference between the final Liberal candidate (Archer) and the independent (Wilkie) at the end of the count. Now, notice by how much the grey bar rose when the last Labor candidate (Bacon's excess) and the last Green candidate (Burnett) were eliminated! It seems these were people who voted 1, 2, 3, 4, 5 for either Labor or the Greens, and no-one else. These votes are often wasted (as it is very unlikely that one electorate will elect five members from the one party) as the votes often "flow" onto other parties. Without making predictions as to who would vote for who, I'd say it would be likely that most Labor voters would put any other party above the Liberals, and most Greens would put Wilkie before any other party. The second point in particular can be demonstrated by the large gain Wilkie received when Burnett was eliminated. If only a small fraction of the the 1-2-3-4-5 Labor or Green voters had've put #6 as Wilkie, we would be looking at a parliament with 10 Labor, 9 Liberal, 5 Green and 1 Independent - which clearly would have a massive effect on who makes the next government! This entry was posted on October 4, 2009 at 12:14 pm, and is filed under politics, tasmania . Follow any responses to this post through RSS. You can leave a response, or trackback from your own site.